There’s something seductive about the ocean. As a world traveler, I think of the ocean as yet another destination where the environment is enigmatic and the residents speak a different language. The ocean is a completely new beast – the true last frontier. It’s been a longtime dream of mine to learn how to sail a boat. I’d love to spend a year or two sailing around the world. 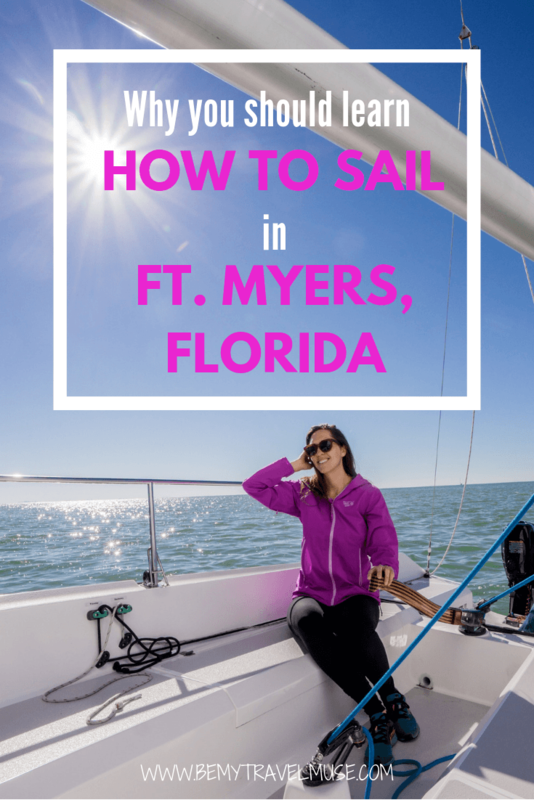 I know that sounds crazy for a girl who has never sailed before, so I decided it was time to take the first step to learn, and it turns out, there’s no better place than the Gulf side of Florida. Ft. Myers would be the perfect introduction. I’d never operated a boat before. I’ve been aquatic my whole life – I was the kid who stayed in the ocean all day and wouldn’t get out of the pool until the absolute last minute – but apart from kayaks and canoes, I’d never driven any kind of water-going vessel. From the moment I showed up to the boat I was basically already sailing. There wasn’t any time to overthink it or freak out because right when I arrived I met my captain, Randan, and without missing a beat we started unfurling the sails and I took over the steering. It was a slick and clever way to teach. I was controlling the boat without having time to even realize it. I liked this teaching style. Instead of painstakingly going over every part and definition in a classroom, I was learning by doing and repeating, like learning a language. This makes sense since learning to sail is like learning a new language – reading the wind and learning the terminology for all of the different parts of the boat and directional terms. It’s like picking up speech as a kid. We went over each thing once or twice and then it was my turn to figure out how the sails and the wind worked together as I practiced picking different destinations and changing course to get there. “What should I do if I want to turn that way?” I’d ask. “What do you think?” Randon would reply. So I tried whatever I thought might work, and slowly but surely it started to sink in. Sometimes I got it wrong and spun us in a circle or picked the wrong direction and we came to a standstill. It didn’t matter because we had the space, the 26-foot boat was sensitive to every movement and nice and stable to learn on. Randon was always there to step in if needed but we had the whole Gulf to practice in and plenty of destinations to choose from so it never felt scary. In a way it’s like learning to drive a car. You overthink everything at first and then I’m sure in time it becomes second nature. That’s why I think Ft. Myers is a good place to learn. You have fairly warm water, consistently good weather from the late fall until late spring/early summer, and lots of destinations to choose from like islands, and beaches that you can’t drive or walk to. It makes for an exciting variety. When I think about the cold Pacific and distance of the Channel Islands from California, I now understand why Florida is preferable. It keeps it light and entertaining in water that isn’t as frigid. The Offshore Sailing School in Ft. Myers is an institution, run by Steve and Doris Colgate. That name didn’t mean much to me at first, but I learned that the name is attached to one of the foremost racing sailors in the United States recently inducted into the National Sailing Hall of Fame. According to Randon, Steve basically ‘wrote the book’ on modern sailing instruction. Now more than 150,000 have learned from this school, and people travel from all over the world to learn there. They offer a variety of courses, ranging from the 4-hour intro course I did to certification courses that include a week of half-day instruction or even a liveaboard option. On the 5-day option, you head out solo (or with the other course participants) and are already sailing on your own! By then you’re able to rent a charter boat around the world and are able to sail! You can find out more about the options here. Bonus – the school is across from the Pink Shell Beach Resort and the rooms there are bigger than most (okay all) apartments I’ve lived in with an ocean view and a full kitchen. I believe you can get a special rate as well when you book via the sailing school. Definitely check out the mangroves! Ft. Myers kept calling me to relax and take it easy, and I loved that about it. The soft colors of the white sand and the incredible sunrises and sunsets, plus the dreamy island vibe and all of the gorgeous birds made it such a nice place to be. You’ve got several islands to choose from as well, whether you’re sailing or driving. I really enjoyed Sanibel. The sunsets were the best there, plus the J.N. “Ding” Darling National Wildlife Refuge has tons of birds and places to walk and chill out. There are several state parks in the area like Lovers Key and Cayo Costa, as well as practically endless mangroves and kayaking, standup paddleboarding, and island hopping options. I went kayaking with Kayak Excursions for the sunset session and loved paddling through the mangrove tunnel and finding hidden beaches and sandbars. It’s the perfect post-sailing activity. Check out the official website for the Beaches of Fort Myers and Sanibel for more info on planning excursions outside of your sailing adventure. 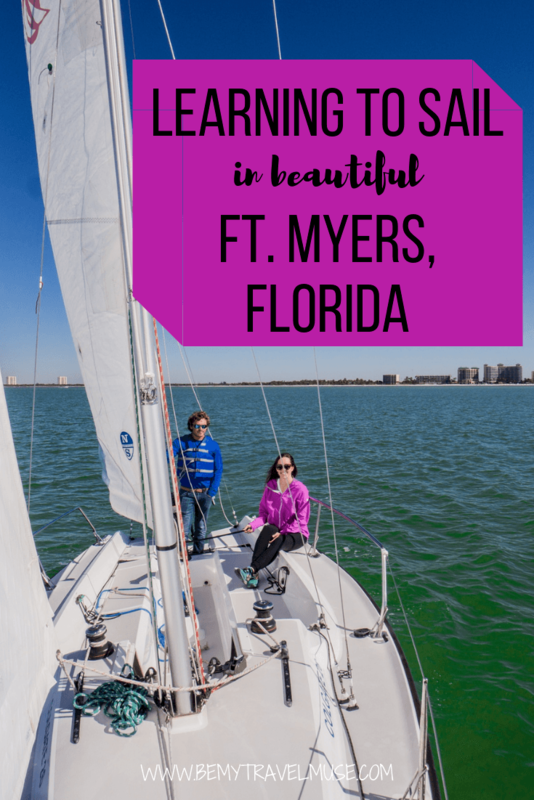 I’m thrilled that I got a chance to try out sailing, particularly in a place that’s as beautiful as Ft. Myers and with such a formidable sailing school. It’s been a dream for such a long time and I can’t wait to keep learning and exploring – maybe right back with Offshore Sailing School! I’m still riding the adrenaline high days later of that first sailing experience. I hope if it’s something you feel called to try, that you get to experience it for yourself. Take a look at Ft. Myers, it ticks all the boxes. *Many thanks to The Beaches of Fort Myers and Sanibel for inviting me to Florida. Desire to sail, review of the experience, and total enthusiasm are all my own, as always! Well I know what I’m doing in the fall! I’ve wanted to do a live aboard sailing course for ages. Amazing! I’d love to know how you feel about it after you do it! I might go back and do the same. It’s a great way and an ideal location to learn how to sail.